Antique copper food cupboard tins set in a dark birdseye maple shaker pie safe. 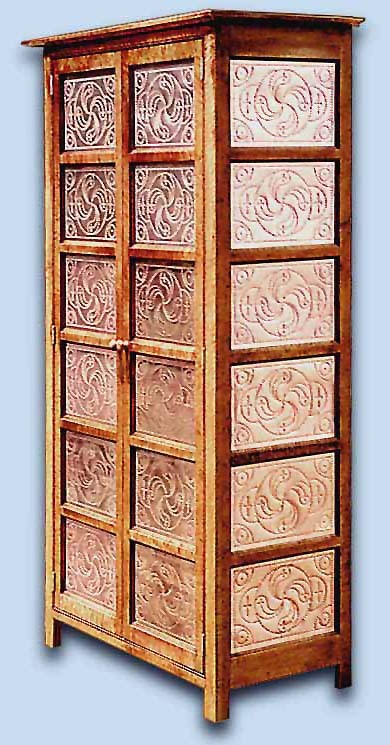 This cupboard, sometimes called a pie safe, is a reproduction of the original antique piece, now located in the "Museum collection" at South Union, Kentucky. It also may be seen in The Complete Book of Shaker Furniture, by T. D. Riemen & J.M. Burks, pg. 344, PL. 316 Food cupboard. The piece shown is in solid birds eye maple, containing six shelves, and features inlaid steel rods in the doors for additional strength, and to prevent movement. The 24 solid copper panels (available in tin also) are handmade in our blacksmith shop, while primarily for ventilation, they are very decorative and add a great deal to the beauty and charm of this truly unique piece. Available in pine, birch, oak and other hardwoods.